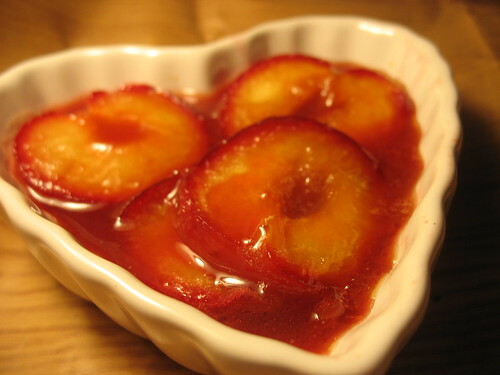 New Wave Domesticity: honey roasted plums! Yesterday was farmer's market day! Well, I guess every day is usually farmer's market day somewhere in Portland when it's summertime, but I love to stop at the market next to overlook park on my way home from work. This is just the perfect time of year for the market and there is so much in season. I bought some fresh eggplants, cucumber, zuchinni blossoms, plums, and some other wonderful bounty so I can cook up a storm in the next few days. This addiction to the honey roasted plums started last summer when Summer made a post on her blog that rocked my world. A very simple way to make late summer plums into a masterpeice. I reworked her recipe a little to fit what I had in the cabinet and combined 6oz of honey + 2 tablespoons of butter + 1 tablespoon of lemon juice + 1 teaspoon of vanilla + 1/2 teaspoon of almond extract. 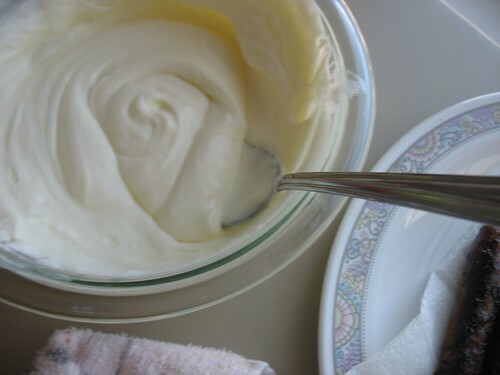 The almond extract helps to work with the vanilla to make the plum flavor pop. Just combine all these things in a blender (or you can use a stick blender) for a few moments until the cream starts to froth and thicken. i make this topping all the time because it is so basic and so wonderful. It also makes perfect side for dipping fruit (like strawberries!) or adding to sweet crepes.